The welfarists declared victory and asked for more donations. I expressed the view–that I still hold–that to call this “ban” a victory is beyond absurd. And this campaign, which raised millions from the public over the years, was a complete betrayal of the animals, as well as the donors. But the welfarists have not finished exploiting this useless campaign–not by any means. And already, the animal groups are getting geared up to wage a campaign against repealing the “ban” that was not a “ban” to begin with. So let’s see what we have here: the welfarist groups solicit donations to get a “ban” that isn’t a “ban” at all. When they get the “ban” that is not a ban, they declare victory and ask for more support. And now, these same groups will solicit donations once again to fight the repeal of a “ban” that is not a ban at all (and, in reality, pivots on a fight between Tories and Labour about a perceived matter of class). Yes, indeed, it’s just a matter of time before we start seeing the appeals with cute pictures of fox cubs and horrific pictures of foxes being ripped apart by hounds, telling people how they can help to stop it all and save the animals if only they donate. And abolitionists who point out the absurdity of the campaign, and the obvious fact that the primary beneficiaries of the campaign are the groups promoting it, will be denounced as “divisive” and told that they are not “activists” because they are not marching to the tune of the corporate welfarist groups who have declared that “activism” is making a donation to a large group and serving as free labor for welfarist and single-issue campaigns that raise lots of money for those corporate groups. But the reality remains: single-issue campaigns (and welfare reform campaigns generally) are nothing but business opportunities for the large groups. They have nothing to do with helping animals. 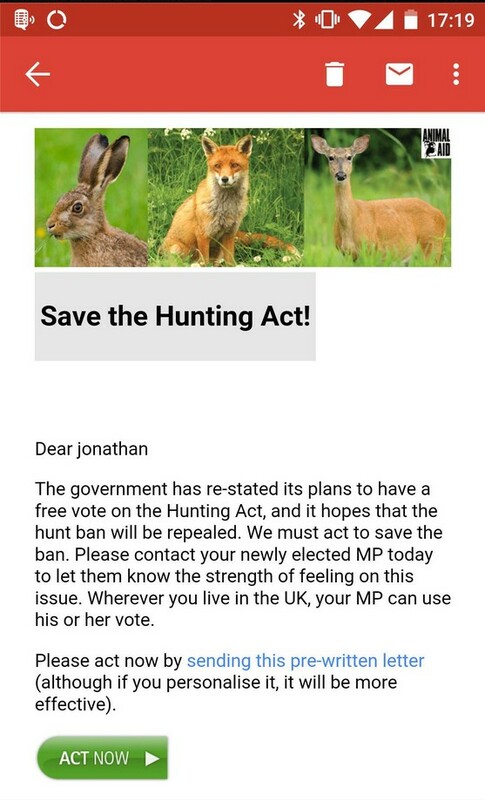 Indeed, these sorts of campaigns do nothing but promote exploitation by, in this case, characterizing fox hunting with hounds as worse than fox hunting by other means, any other hunting, or the use of animals for entertainment, or any other purpose. It’s a business plan that works. Think of how many careerists do not have to work a regular job and have the luxury of being full-time “activists,” treated as celebrities by people who serve as free labor for them. But let’s be clear: it’s got nothing to do with helping animals. I see that Ricky Gervais has now picked up the banner for those fighting the repeal of the “ban” that is not a ban. This assures that the large groups won’t be far behind. And it illustrates a central problem with single-issue campaigns. Foxes have no greater value than the animals whom Gervais, a nonvegan, exploits. They’re just so very, very predictable.